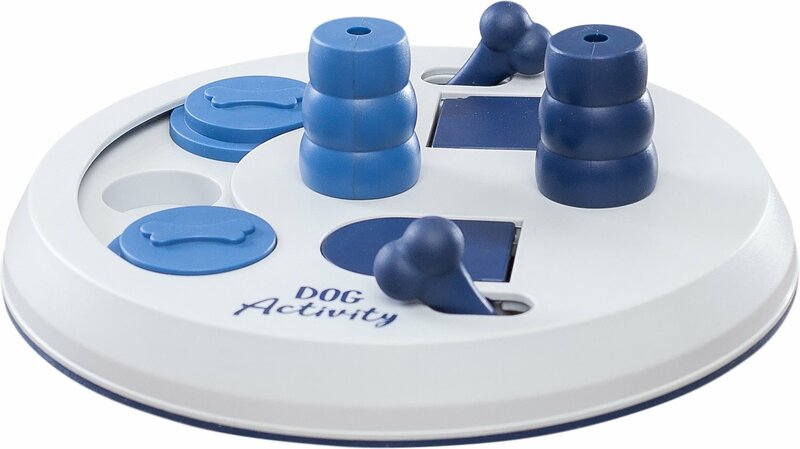 Trixie Dog Activity Flip Board Toy provides the perfect outlet for your dog’s energy and curiosity. Ideal for the intermediate canine gamer, it rewards your pet for correctly opening various compartments. Simply hide your dog’s favorite treats in the compartments and watch as she uses her intellect to get to them. Due to the unique design, the cones cannot be knocked over and must be lifted straight up to be removed for an added challenge. Vary the number and placement of treats to increase the level of difficulty. The non-slip rubber rim keeps the game in place as your dog explores. Trixie Dog Activity Flip Board Toy is dishwasher safe for easy cleaning. A challenging and stimulating outlet for energetic, curious dogs. Ideal for dogs who enjoy puzzle games. 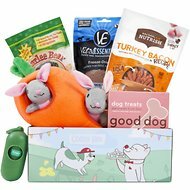 Rewards your dog for correctly opening various treat-hiding compartments. 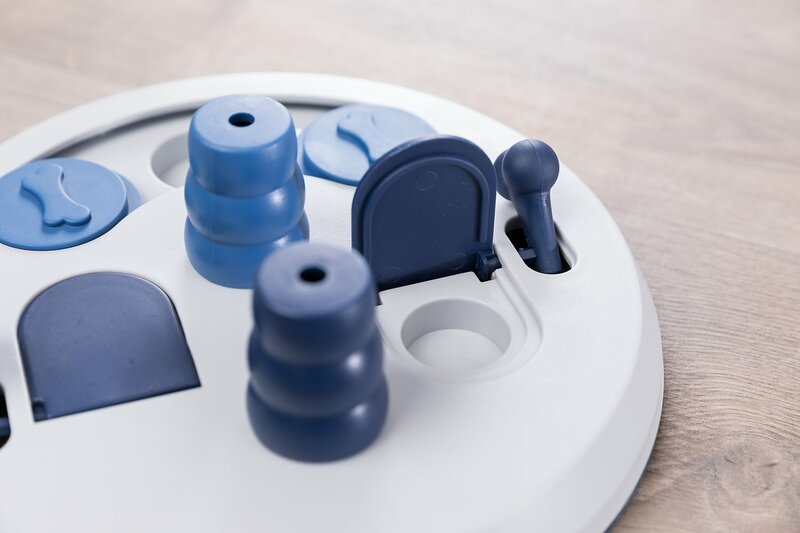 Non-slip rubber feet keep game in place during playtime. Flip board, booklet with tips to design training program. My dogs love this toy! At first, it was a little hard for them to get the hang of, but now when I have them do it, it takes them less than 30 seconds to get all of the treats! Although I would caution, the detachable pieces are a little bit small for larger dogs. I have two 80+ lbs Dobermans and its a little small for them, so if you have a large dog with a tendency to swallow small objects, I would take those pieces away. But they still have a lot of fun with the 2 other functions!! My one boy discovered if you pick up the whole toy with his mouth and throw it across the whole room, all the treats fall out! That shows a kind of intelligence I did not expect. LOL but it is a great toy!! Just like my dog I’m not quite sure about this toy. My dog is smart, but didn’t really know what to do with this then lost interest. I did have to take away the 2 pieces that lift up due to her just wanting to eat them. Kind of reminded me of those old baby toys that you would have to push a button, slide things, and turn things to get the top to pop open. Bought for my two puppies. They have a blast with it. We use it for feeding time sometimes to break up the monotony of their day. It works great for dogs that need to slow down eating as well. You do have reload it multiple times but that just helps to slow the food intake down even more. Great for small dogs and beginners! My little rat terrier-mini poodle mix (6 lbs) 8 month old puppy solved this over the course of a few sessions in the same day. Maybe 30 minutes overall. She is really entertained by it! It’s clear she likes the sliding part the best and the ones that get knocked over least. She goes back to “check” the compartments even after she’s cleared them all just to make sure everything’s gone. Even though she has them all figured out, it’s pretty clear that she’s having fun with it! She even ate her regular kibble out of it. She kept looking at me like “well, pick a spot to hide it already!” Highly recommend this! My dog figured out how to get the treats out within minutes. I reloaded it, then my phone rang and I went to answer it. When I came back five minutes later, the puzzle was broken. My bulldog had snapped both the levers off that open two of the compartments. My fault, I shouldn't have left him unsupervised. But, I would've also thought such a toy would be made to withstand a bit more than that. My dog is a French bulldog mix, so not a huge boy. This puzzle should probably not be given to any dog larger than a toy breed. My Labrador loved this at first but figured it out quickly. It just seems like a waste of money. It was fun at first but she just figured it out faster than I thought she would and she loves all her challenge toys. If your dog loves a challenge don’t waste your money on this toy maybe go to a challenge three. I have three dogs and all three have handled this activity board differently. My poodle mix got it right away and can't stand seeing the others work it and wants to jump in and show them how it's done...or get all the treats for herself. My Chinese Crested has not mastered it yet, but every other day or so we play with it and I think she'll get it. My American Bulldog plows through it, since he can't stand seeing his little sisters do something without him, but he hasn't totally mastered it yet either. This is a great beginner board for dogs to work their brains on rainy and cold days. This was almost perfect for our dogs, but our Husky mix was a bit too destructive for it. The kong looking pieces come off completely, and he just used them as chew toys. The bones that stick out were easy for him to break, but the slides are awesome! This would be perfect for a small breed or a non-destructive dog. My dogs, ranging in age from 2 months to 13 years, love this game. It is fun to see my elder JRT get completely into it as well as my Corgi puppy trying to figure it out. Highly recommend. The only drawback is the cones come off and become a prize to run off with so close supervision is needed.